Yokogawa introduced the world's first vortex flow meter for industrial use in the 1960s, which is now widely used for measuring liquid, gas, and steam. 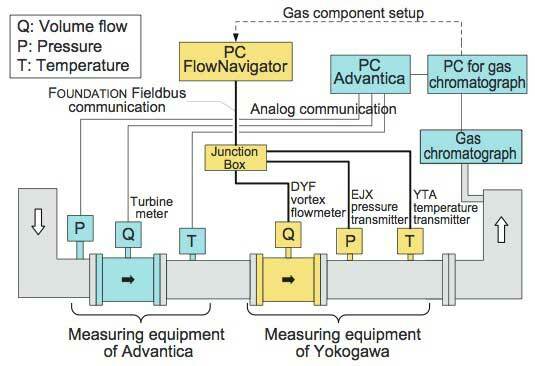 However, Yokogawa's digitalYEWFLO vortex flow meter had limited functions in tracking pressure changes especially in the measurement of gas and steam, for which mass flow measurement is generally required, due to the use of the pressure value as a constant. The newly developed FieldMate FlowNavigator flow configuration software applying Field Device Tool/Device Type Manager (FDT/DTM) technology has made it possible to compensate density using a physical properties database. Combined with FOUNDATION Fieldbus type digital YEWFLO, it can accurately calculate mass flow. 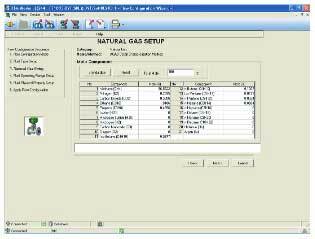 This report describes mass flow calculation in the FOUNDATION Fieldbus type digitalYEWFLO, and highly accurate calculation of the mass flow of natural gas by FlowNavigator with actual test data. Vortex flow meters have been appreciated by users as volume flow meters, which can, in principle, be applied to any flow measurement of liquid, gas, or steam. Volume flow measurement is enough for substances with small variations in density such as liquid. However, mass flow must generally be calculated for steam and gas because their volumes vary significantly depending on temperature and pressure. 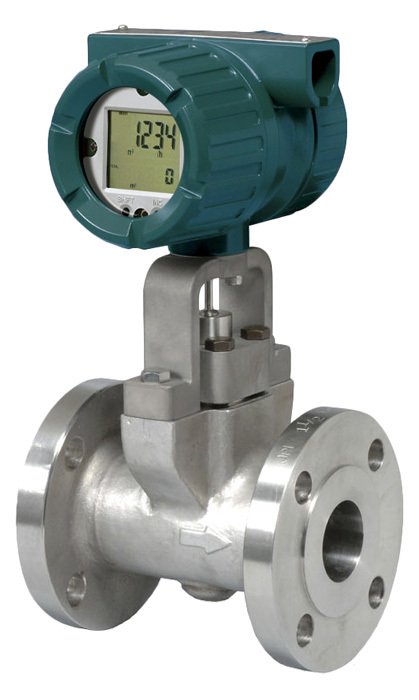 Although the current digitalYEWFLO vortex flow meter1 in the market is capable of calculating mass flow for liquid, gas and steam, it has limited functions in tracking the pressure changes of measured fluids and providing highly accurate mass flow calculations because it partially regards the pressure value as a constant. We have developed FieldMate FlowNavigator flow configuration software that runs on the FieldMate Versatile Device Management Wizard2 which utilizes the Field Device Tool/Device Type Manager (FDT/DTM) technology. 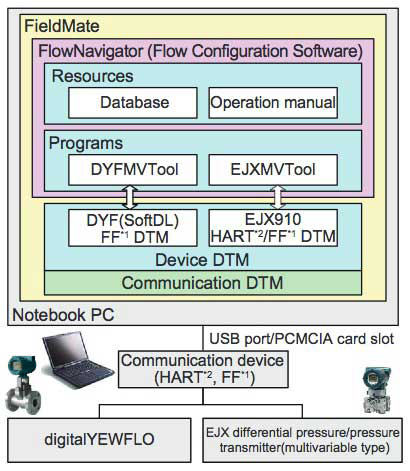 Combined with the FieldMate FlowNavigator, Yokogawa's FOUNDATION Fieldbus communication type digitalYEWFLO has resolved the disadvantages mentioned above. 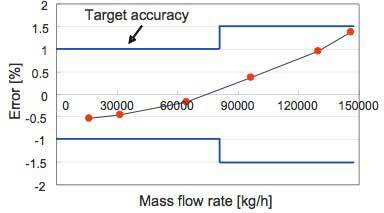 In addition, mass flow calculations can be set up interactively, resulting in significant improvement of user's convenience. Figure 1 shows the external view of the digitalYEWFLO and the FlowNavigator medium. 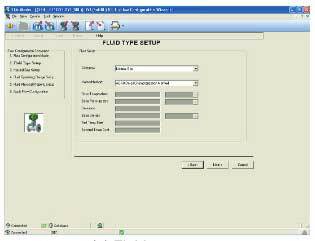 Yokogawa's FOUNDATION Fieldbus communication type digitalYEWFLO is capable of providing various mass flow calculations as listed below by configuring it using the information required for mass flow calculation through the FlowNavigator. The FOUNDATION Fieldbus communication type digitalYEWFLO can output mass flow rate responding to the varying conditions of the measured fluid by retrieving temperature and pressure data via the fieldbus. Figure 2 shows a system configuration example where the FlowNavigator is used with a vortex flow meter and pressure transmitter to provide highly accurate mass flow measurement of general or natural gas. 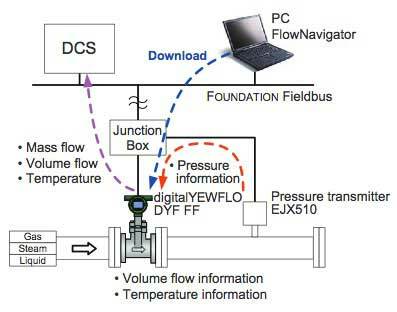 Since the multivariable type digitalYEWFLO maintains fluid temperature in addition to volume flow rate, it can calculate mass flow rate by retrieving the pressure value from the pressure transmitter via the fieldbus communication. 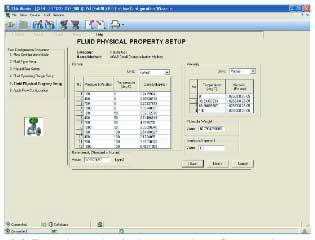 Data required for measurement, including fluid conditions and unit of mass flow, are set in the FlowNavigator on the PC. Among these data, the density compensation coefficients used for density calculation are downloaded to the digitalYEWFLO via fieldbus communication. The digitalYEWFLO uses downloaded parameters, including density compensation coefficients, to perform mass flow calculation. 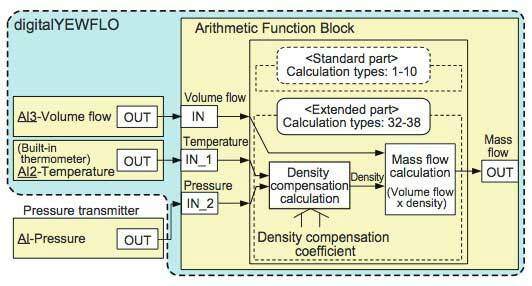 A formula of density compensation for calculating the mass flow rate of gas is shown below. The digitalYEWFLO performs density compensation calculation using polynomial approximation to obtain highly accurate mass flow rate. Figure 3 shows the configuration of the function blocks (FB) of the FOUNDATION Fieldbus communication type digitalYEWFLO which performs the mass flow calculation. Eight FBs are implemented in the digitalYEWFLO. The output from the AI2 (Analog Input 2) FB is temperature, and the output from the AI3 (Analog Input 3) FB is volume flow rate. Both output, together with the pressure measurement from the external pressure transmitter, are connected to INs of the AR (Arithmetic) FB. The AR FB offers extended calculation functions to enable various mass flow calculations as summarized in Table 1.
d) Temperature/pressure compensation calculation for gas Calculates gas density with compensation for temperature/pressure based on Boyle's Law and Charles' Law. f) Temperature/pressure compensation calculation for gas (polynominal approximate calculation) Calculates density using the polynominal approximation defined in the FlowNavigator. Figure 4 shows the configuration of the FieldMate FlowNavigator. The FlowNavigator runs on the FieldMate, and it comprises programs and resources. 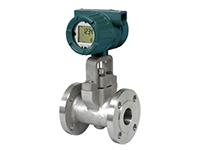 The programs include two flow rate calculation programs, DYFMVTool for the digitalYEWFLO vortex flow meter and EJXMVTool for the EJX series differential pressure/pressure transmitters3. The resources include the physical properties database etc. The DYFMVTool started by the device DTM calculates density based on interactively set data such as the properties of the fluid, calculation standard, pressure and temperature conditions, gas components, etc. The compensation coefficients required for density calculation are eventually downloaded to the instruments. Figure 5 shows examples of DYFMVTool settings and density calculation results. Mass flow tests were conducted at a natural gas test site of Advantica in the UK, which has been certified by the United Kingdom Accreditation Service (UKAS)4. Figure 6 shows the test results for two different sizes: 50 mm and 150 mm in diameter. 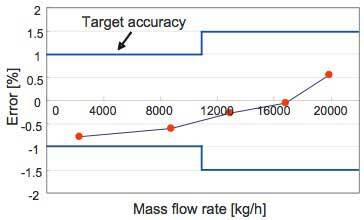 Both have been verified to be within the target ranges of mass flow rate accuracy. Figure 7 shows the system configuration used for the testing. As reference, the mass flow rate was used; the volume flow rate was measured by a UKAS-certified turbine meter and then the mass flow rate was calculated through compensation of temperature and pressure. As for natural gases, gas components must be measured to compensate the density. Thus, gas components were measured using a gas chromatograph and their values were transmitted to the Advantica's host PC and the DYFMVTool. The DYFMVTool performed calculations based on AGA No. 8, a standard for calculating natural gas densities established by the American Gas Association, and downloaded the density compensation coefficients to the digitalYEWFLO under test. The digitalYEWFLO calculated the density using the downloaded compensation coefficients taking the temperature and pressure into account, and then calculated the mass flow rate by multiplying the volume flow rate measured by digitalYEWFLO by the density. Combination of the FieldMate FlowNavigator and the FOUNDATION Fieldbus communication type digitalYEWFLO has enabled highly accurate mass flow calculations. In addition, the interactive setup has improved operability. We plan to provide this solution with other protocols than FOUNDATION Fieldbus supported by the FOUNDATION Fieldbus communication type digitalYEWFLOW. Furthermore, we are continuously enhancing diagnosis- based application software such as impulse line blockage diagnosis, utilizing the FDT/DTM technology. We will continue to create products that contribute to society. digitalYEWFLO, FieldMate, FlowNavigator, EJX, EJXMVTool are registered trademarks of Yokogawa Electric Corporation. FOUNDATION Fieldbus and HART are registered trademarks of Fieldbus FOUNDATION and HART Communication Foundation (HCF), respectively. 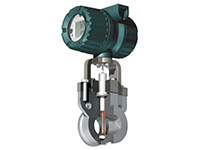 Yokogawa's 2-wire Multivariable Vortex Flow Meter.